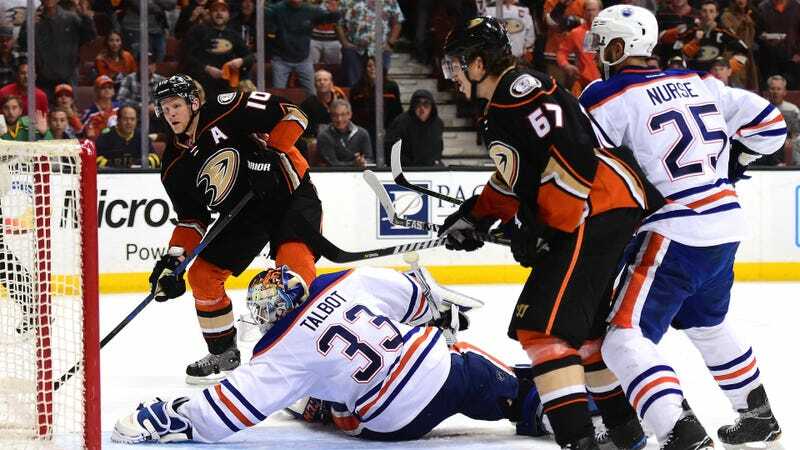 The Oilers were three and a half minutes from a shutout victory in last night’s Game 5 against the Ducks. Then everything went wrong. Edmonton coughed up their 3-0 lead in the final minutes of regulation, allowing Anaheim to score three goals in three minutes and ultimately losing in double-overtime. After the game, though, much of the focus was on something that didn’t happen—perceived goaltender interference that wasn’t called in the last 20 seconds of the third period, opening up a chance for Rickard Rakell to score the tying goal. Kesler obviously makes contact with Talbot, but it’s difficult to tell if he actually lingered to grab his leg pad. It’s also difficult to have sympathy for a team arguing a no-call after coughing up a 3-0 lead in three minutes.